One is Life’s a Jungle: Africa’s Most Wanted, a cheap, direct-to-video rip-off of DreamWorks Animation’s Madagascar franchise from Canadian distributor Phase 4 Films, just in time to take advantage of all the publicity for Madagascar 3: Europe’s Most Wanted. How bad can it be? Cartoon Brew posts its trailer so you can see for yourself. If this gets onto this year’s Ursa Major Award final ballot, I will personally destroy the ALAA. 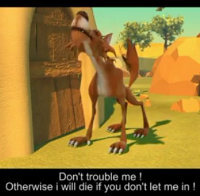 The other is Buz-e-Chini, Afghanistan’s first CGI animated film, about goats facing up to a fierce wolf. It is in Hazaragi, a language I confess I never heard of before. I feel like I’m taking a cheap shot for criticizing this; considering what the Taliban does to anybody they catch trying to live outside what they have decided the Koran allows, it is risky in Afghanistan to be involved in cinematography of any sort. The young director, Abbas Ali, prudently made most of the production in neighboring Pakistan; it is dedicated to Hussain Ali Yousafi, the wolf's voice actor, who was assassinated in 2009. Still, the American CGI industry has nothing to worry about. I am reminded of Dr. Johnson’s famous epigram on a Quaker women preacher; “Sir, a woman's preaching is like a dog's walking on his hind legs. It is not done well; but you are surprised to find it done at all." Considering the difficulties that Ali worked under, the producers of Life’s a Jungle should feel especially ashamed of themselves. Life's a Jungle would perhaps be impressive if it were made 10 years ago. As for Buz-e-Chini, I applaud their efforts to enter the world stage and to spread the word of peace. Hopefully they can distribute it to a wider audience. I disagree with the first part of your statement. Ten years ago was 2002. By then CGI animation from “Tony de Peltrie” (1985) through Pixar’s first shorts and features “Toy Story” (1995), “A Bug’s Life” (1998), “Toy Story 2” (1999), and “Monsters, Inc.” (2001), as well as DreamWorks’ “Antz” (1998) and the first “Shrek” (2001), were out. “Life’s a Jungle” looks embarrassingly primitive compared with any of these. I agree with your second statement, and hope for Abbas Ali's and his staff's continued growth onto longer and better projects. Yeah, I think I missed a decade there. Either way, Jungle looks utterly devoid of plot and quality. I just finished watching Buz-e-Chini, and I'm not sure the message of peace came through as loudly as it was intended, but it was certainly interesting to see folklore brought to life. Buz-E-Chini is actually pretty good! Sure, the rendering technology and character design are a bit dated, but look at how much detail the animators went to in building the world and conveying the characters' expressions and subtle motions. It looks at least as good as any of the top-tier short films coming out of CalArts that get ridiculous levels of praise for being student films, and those weren't produced under threat of assassination by a cartel of theocratic bullies. Also, consider the vast difference in the REASON for producing the films; one of them is a celebration of nearly-lost, suppressed culture in an attempt to bring peace and understanding to the world (using a fable about overcoming an abusive, deceptive oppressor and then ultimately forgiving him), while another is a cynical direct-to-DVD cash in. It is horribly unfair to even remotely imply that these two things are in the same class of production. Too bad that when the West finally pulls out of Afghanistan, the Taliban are going to take over again and hang all the animators in front of the smoking ruins of their studio. While the past is usually an indicator of the future, such is not always the case. Folklore isn't typically political, so it would be hard to fabricate a motive for such a crime. Don't kill me TOO badly Fred: I might (ah say MIGHT) suggest Buz-E-Chini for the recommended list as a Short. I was actually pretty impressed. As for that other thing... um, no. I am only threatening to destroy the ALAA if Life's a Jungle makes it to the Ursa Major Award final ballot, not Buz-e-Chini. Surely, recommend the latter as worth seeing if you feel that it is. I can even agree that it is worth seeing as what an Afghan animation director-producer can accomplish. An individual recommendation will not get a title onto the final ballot. Glad to hear the discussions on a forum where people actually having a great understanding for a film and the dying culture of Afghanistan, actually I was not having this big expectations from Buz -e- Chini but still I was thinking of creating something which can make my people forget about their past for a while and smile for a bit and to add something new, something modern to afghan cultural archive, and obviously the message of peace and forgiveness is there. I still have the plan of starting a new movie which will probably be in 2D animation containing a great subject for afghan people that may leave a great impact over new generation, and i really don't know what new challenges I will probably be facing this time. I'm trying my very own studio in Kabul, let's see if I can make it through Taliban's observation or not? Wish me luck, guyz, because I'm not running to earn billions of dollars but to cut from my livelihood and expenses to spend it on my new film and hopefully I will come up with the new movie very soon if the economic conditions will remain stable, though it is not very good, lolz. Thanks again guyz your words are quite appreciating!